Sewer lines in your home can suffer from many problems as time passes. Tree roots can penetrate them, clogging up the water flow; cracks and breaks can develop as the pipe ages; and shifting grounds can loosen or dislodge the pipe’s joints, breaking it or making it collapse. When these issues are present in your pipes, sewage can leak out, filling the air with an unpleasant smell and releasing harmful bacteria into the soil. 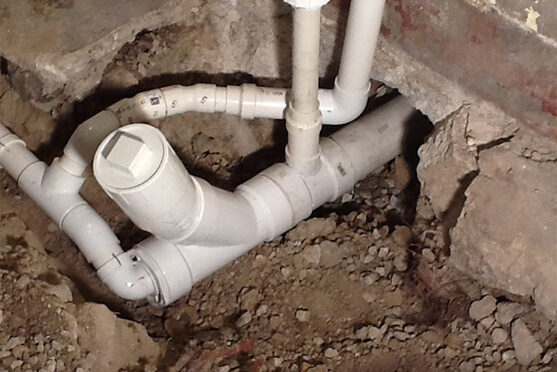 Fortunately, modern plumbing technology can solve these and many other problems that can happen with the sewer line. Sewer repair, replacement and relining no longer requires digging trenches to access the pipes, so there is minimal damage to your landscape, which eliminates the additional costs of remediation. It is also more affordable than excavation methods that require heavy machinery and fill your yard with piles of dirt. Rapid Plumbing offers competitive prices for all of our services with discounts and savings always available. It all starts with a video inspection that lets us diagnose the condition of the pipes. This helps us decide if they can be repaired, or if they are too damaged and need to be replaced. If the line is in good enough condition, we can proceed to repair it by relining it. This is done by inserting a liner coated in epoxy into the pipes. When the epoxy cures and hardens, it acts as a pipe within the pipe, sealing any leaks and preventing any roots from entering. If the sewer line is too damaged to be repaired, it can be replaced with a process known as pipe bursting. Instead of digging out the pipes and laying out a new line, a cone-shaped head is inserted into one end of the sewer run that will be substituted. As it travels through it, the head simultaneously bursts the pipes and pulls the new pipe section behind it, replacing the old one. Replacing and relining the sewer line are long-term, eco-friendly solutions that will keep the wastewater flowing into the city’s sewer as it should, instead of leaking into the ground, or even worse, backing into your house.